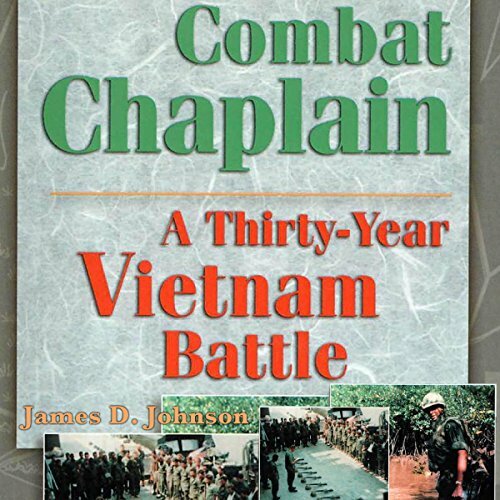 Chaplain James D. Johnson chose to accompany his men, unarmed, on their daily combat operations, a decision made against the recommendations of his superiors. During what would be the final days for some, he offered his ministry not from a pulpit but on the battlefields - in hot landing zones and rice paddies, in hospitals, aboard ship, and knee-deep in mud. Through his compelling narration, he takes us into the hearts of frightened young boys and the minds of experienced men. In Combat Chaplain, we live for eight and one-half months with Johnson as he serves in the field with a small unit numbering 350 men. The physical price can be counted with numbers - 96 killed and over 900 wounded. Only those who paid it can understand the spiritual and psychological price, in a war that raised many difficult moral issues. "It placed my soul in the lost and found department for a while," Johnson writes. This is one man's chronicle of Vietnam and the aftermath of war, of his coming to terms with his posttraumatic "demons", and his need for healing and cleansing which led him to revisit Vietnam 28 years later. Yes. The horrors of war are familiar, and many books on the subject don't rise above the level of a catalog of tragedies, but Combat Chaplain brings home the physical and psychological toll of Vietnam. It focuses or moral dilemmas but doesn't lecture or preach...it shows how a dilemma is just that -- a choice between alternatives, often alternatives that aren't very good in either case. Which character – as performed by Philip Benoit – was your favorite? The story is told throughout in the voice of the author, Captain James D. Johnson. The narration is superb. With one voice throughout, there is always the danger of the rendition becoming monotonous. But Benoit's narration is engaging and subtle...he reveals layers and complexity of the main character's personality in a very realistic and engaging way. Yes, although I do most of my listening in the car and didn't have the opportunity to play the work through in one sitting. I checked the narrator's web site and read something about his experiences in Vietnam. I would imagine that Benoit's background lends to the authenticity that is readily apparent in this rendition of the book.